Honour roll commemorates those from Deep Bay to Garden Island Creek who served in World War One. It lists 23 names. 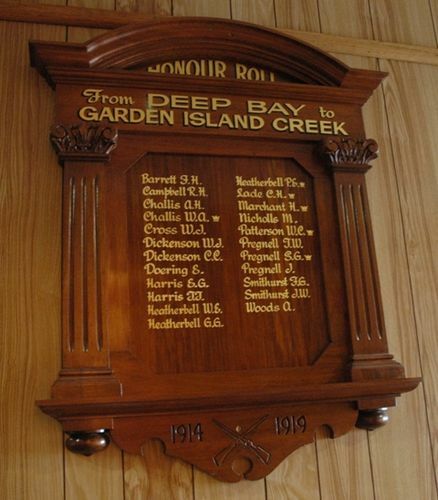 The district between Deep Bay and Garden Island Creek in the Cygnet municipality sent 23 men to the war and of that number, six were killed. To commemorate the names of those who enlisted an honor board was unveiled at Deep Bay on Saturday afternoon by the Hon J. W. Evans. Addresses were given by the Warden of the municipality (Cr R. Harvey) by the Master Warden of the Hobart Marine Board (Mr R. G. Rogers), and by Dr. Wade and Crs. Harris and Gordon. Mr W. L. Clennett jun. was the secretary of the committee which carried out all the arrangements connected with the erection of the board. Huon Times (Franklin, Tas), 12 November 1920.